KayKiSpeaks.com: OMG! Pretty Hustle's OMG Girlz Are Making MAJOR Moves! OMG! Pretty Hustle's OMG Girlz Are Making MAJOR Moves! What a fun ride it has been for the three adorable young women of Pretty Hustle's girl group- The OMG Girlz. Thanks to reality tv, we've been able to watch Star, Beauty, and Baby Doll make the idea of another fresh girl group a reality. The group finished up two tours, released two really hot singles Gucci This and Where the Boys At, performed for the BET Pre-Awards show and much more all in a span of a couple of years... that Pretty Hustle brand is REAL. The Girlz were just made aware that they are among the nominees for the annual NAACP Image Awards. They've been nominated for Outstanding New Artist and for good reason. Among their major work ethic, the ladies also recently started their own charity- OMG Cares which focuses on the betterment of young women ages 12-21. Through this initiative they combat educational, domestic, and social issues facing girls today. The Girlz hope to combat some of the negative imagery young women see in the media. How dope is that?! Even Beyonce loves them! 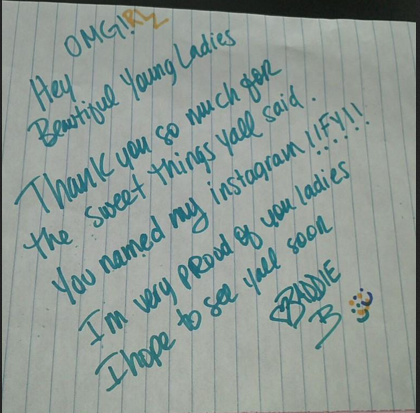 She recently wrote them a cute little note telling them that they inspired her IG name! I've said from the beginning that I am totally excited about their careers. They have the full support and backing of vets in the game- Tiny & Tip, they're all talented, swagged out, and just really sweet girls. I'm excited to watch what 2013 will be like for them! Watch them on the 44th NAACP Image Awards on February 1, 2012 at 8EST on NBC.